This is a series of six articles. Get Day 1: Pushing here. Get Day 2: Rushing here. Get Day 3: Dutifying here. Judgment is the cousin of guilt and shame. It is the aunt of resistance and control addiction. It is sister to the dutifying of life. Judgment once came from your elders or culture. Now you internalized those voices, and you are constantly judging yourself and feeling inadequate or declaring yourself guilty. You add injury to this inadequacy by trying to control your results, your work or your life in order to make it look like you think it should be —which is usually the same as what you think that others think that it should be. The result is cheer misery. If there is one thing you should abolish in your life to be free, this thing is judgment. 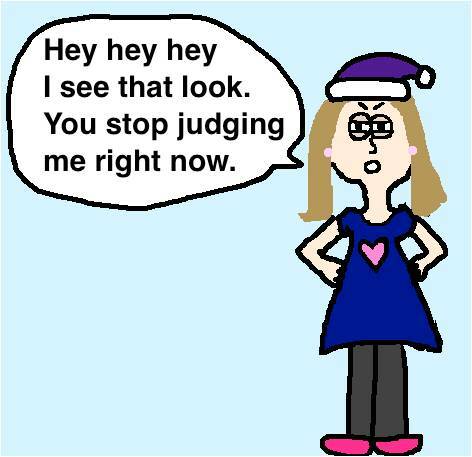 Stop judging yourself and you will soon stop judging others. Judgment is unnecessary and inefficient. It alienates but it does not explain, solve or change anything. Many women who are doing great work come to me confessing that they do not feel successful. Why? Because they have some flaw. Because there is an aspect of their lives that they are still working on. In other words, they have achieved great things that most of the population never even dreamed of; but because ALL of their life is not perfect, they don’t see themselves as successful and they do not ALLOW themselves to enjoy the success that they DO have. If your gifts and unique value has not been honored by your parents, family and loved ones you may be suffering from self-judgment; so that no matter how good what you do is, you cannot receive that goodness. Instead you are focused on what does not work or what could be better. Develop unconditional self-love and acceptance for yourself, just as you are right now, without judgment. Receive what is good, what works. Receive your value. Value what you do, your gifts and talents, your uniqueness, your original perspective and perception of the world. It is a gift from the Divine. I spent one entire year shifting from judgment to self-love. It was the only thing I concentrated for the entire year. At the beginning it was almost a 24 hour task. I would find myself judging myself about 50 or more times a day… and this is after 20 years of personal growth and training as a Woman of Power! I caught myself calling myself lazy when I was too tired to work anymore. I caught myself calling myself stupid every time I made any little mistake or miscalculation, even if I just forgot to put the cap in the oil bottle. After about 3 months, I was down to 30 daily instances of self-judgment. After about 6 months, I was down to about 10 daily instances of self-judgment. I realized that it was working. That I was changing my habit. I kept at it. Today I rarely judge myself. It feels so good! Most days there is peace inside me and I feel good about myself. Whenever I start feeling like I’m wrong, I’m not good enough, I’m incomplete, I haven’t done enough… I pick up my Self-love mantra and go at it once more. Judging yourself is a learned limitation and a bad habit. It may be the symptom of what I call the Orphanhood of the Soul; the result of a lack of unconditional love from the mother or mother figure during childhood. Self-mothering is a powerful practice for women. First, it involves healing the Inner Mother and cleansing her from the Shadow Mother that may have judged or even abused us. Our Inner Mother gets healed as we practice unconditional self-love and acceptance of our Inner Children. Loving ourselves through time, including babyhood, toddler-hood, infancy, school age and adolescent is the remedy for self-judgment. Loving all aspects of ourselves without judgment. This is the remedy to judgment. This is a series of 6 articles. How do you Judge yourself? Any ideas on how to stop judging yourself that have worked for you? Feel free to share on the comments below!